A delicious dish from Lanserhof’s cookbook “The 50 healthiest 10-minute recipes”. Add the soured cream, coarsely ground spelt, egg, baking powder, salt, pepper and nutmeg to a mixing cup and blend with an immersion blender until you have a smooth batter. Heat the ghee in a skillet. Spoon the dough into the skillet, spread out evenly to make silver dollar pancakes and cook on both sides until golden brown. In the meantime, heat the ghee for the pak choi in a second skillet. Sauté the pak choi on each side for 30 seconds, deglaze with the white wine and stir in the tahini. Season with the sesame oil, salt and pepper and top with the chili powder. 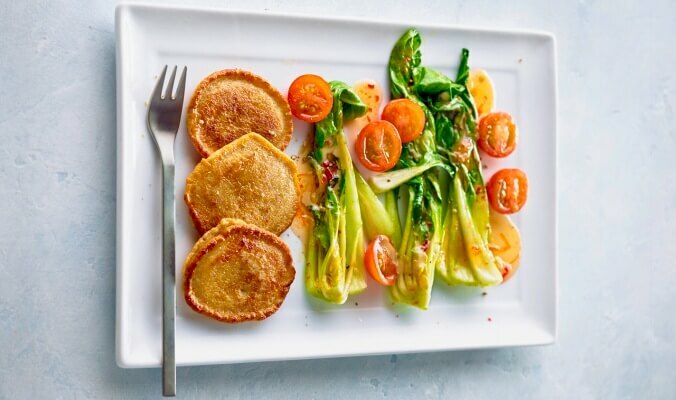 Arrange the pak choi and silver dollar pancakes on pre-warmed plates. Drizzle the Sweet Asian Sauce on top and garnish with the tomatoes. Do you want to try out more recipes? Check out this fitness burger with apple, pear and bitter greens created by the chef from Lanserhof Tegernsee health resort.